Enriched Flour (Wheat Flour, Malted Barley Flour, Niacin, Iron, Thiamin Mononitrate, Riboflavin, Folic Acid), Degermed Yellow Corn Meal, Whole Wheat, Vegetable Oil (Soybean, Canola, Sunflower, and/or Rice Bran), Sugar, Salt. 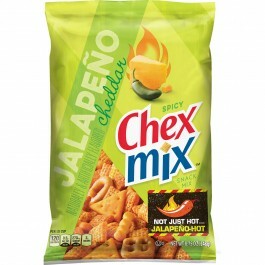 Contains 2% or less of: Maltodextrin, Whey Powder, High Fructose Corn Syrup, Onion Powder, Garlic Powder, Dried Jalapeno Pepper, Yeast, Buttermilk Powder, Dried Cheddar Cheese (Milk, Cheese Cultures, Salt, Enzymes), Color (Annatto Extract, Paprika Extract, Yellow 5, Yellow 6, Yellow 6 Lake, Yellow 5 Lake, and Turmeric Extract), Baking Soda, Tomato Powder, Barley Malt Syrup, Butter Concentrate (Cream, Salt, Natural Flavor), Yeast Extract, Spice, Natural and Artificial Flavor, Distilled Monoglycerides, Trisodium Phosphate, Yellow Corn Flour, Calcium Carbonate, Citric Acid, Corn Syrup Solids, Sodium Acid Pyrophosphate, Cheddar Cheese Powder (Milk, Salt, Cheese Cultures, Enzymes, Disodium Phosphate), Sour Cream Solids (Sour Cream [Cream, Cultures, Lactic Acid], Cultured Nonfat Dry Milk Solids, Citric Acid), Monocalcium Phosphate, Lactic Acid, Autolyzed Yeast Extract, Disodium Phosphate. Freshness Preserved by Sodium Metabisulfite and BHT.